The Guide could not have been made without the generous help of the associates and several individuals of whom the following ones should be extra mentioned: David Erik Pipan (Mt. Prižnica, Mt. Vodice, Mt. Sveta Gora, Mt. Škabrijel); Niccola Relevant, FVG Turismo, www.itinerarigrandeguerra.com (Kras Carso, Outdoor Museum Brestovec, Outdoor Museum Monte San Michele, Redipuglia Redipulja, Outdoor Museum Ermada, Trieste Trst); Mitja Močnik (Goriška Brda, Outdoor Museum Sabotin, Kras Carso); Simon Kovačič (Vrtojba, Šempeter pri Gorici, Mt. Markov hrib, Vrtojba-Bilje hills); Konrad Marušič (Outdoor Museum Jama Pečinka); Marco Mantini (Thematic Park of the Great War, Monfalcone Tržič); Jože Silič, Matjaž Ravbar, MA, Mitja Močnik (Aviation on the Isonzo Front). Our thanks also go to all the employees in the tourist-information centres along the Walk of Peace, since a lot of information has been taken from their web-pages. Contacts are specified at the end of the Guide. We also owe sincere thanks to Petra Testen, PhD, for her editorial work, to Petra Svoljšak, PhD, Renato Podberšič, MA, and David Erik Pipan for their expert advices. We express warm thanks also to all the organizations, societies and individuals who help to keep the memory of the Isonzo Front alive through their active approach and work. Dear visitors to the Walk of Peace, Here comes a Guide to acquaint you with the cultural-historical heritage of the Great War. In addition to rich photographic and cartographic materials, the book also contains descriptions of individual historical sites that are certainly worth visiting. The Guide will lead you along the vestiges of the Isonzo Front, past the summits of the Julian Alps in the Upper SoÄ?a Region, across the areas of GoriĹĄka and the Kras and to the shore of the Adriatic. The text lays special emphasis on outdoor museums which are arranged in the areas of the onetime Italian and/or Austro-Hungarian front lines. At these sites the remains of the Great War are best preserved, reconstructed, maintained, and also easily accessible. We wish you a pleasant tour! To the gentle reader ... Along the Walk of Peace from the Alps to the Adriatic the past, the present and the future are intertwined and confronted with each other. The past does not only mean the 29 months of the warfare on the Isonzo Front but also includes the past of war recollections and military history of the Isonzo Front as well as its countless reflections both in Slovenian and European historical memory. These have been impressed into the landscape, the people who remained and those who had to leave, the soldiers, their commanders, the multitude of crosses, tombstones, memorial tablets with the names of the buried, into the heaps of published books and into the ways of recollecting in the countries that took part in it. The memory either stayed in the shade of other recollections or was the central pillar of national collective memory. In some places, it gave way to the memory of the second great war of the 20th century and its resultant social changes, or it was possibly just subordinated to the uncompromising history of the defeated, the guilty and the responsible who tailored the European post-WWI history. On the other hand, this memory did neither bow to the time nor to the turbulent processes and events of the century to which the Great War paved the gory way. In some historical recollections the memory was for decades focused on its military ego, since the Great War was the last great warfare of the Monarchy to which the Soča (Isonzo) Region had for centuries belonged and defended its western borders; in other places it was the topic of controversies and political argument; and elsewhere, a quietly smouldering intimate memory that could not be revealed for many years. For decades, even for a whole century, soldiers kept building up the memory with their stories, diaries and letters; civil population kept building it up with their experiences of exile, refugee camps, life in the direct vicinity of the front in the conditions of military occupation; histories of strategies, military battles, war decorations kept building it up; and so did life and death. After a hundred years, the locations of the twelve Isonzo Battles underwent essential transformation: by means of a cross-border project and through the self-motivated collaboration of institutions and individuals from both sides of the onetime border river they became locations of the so desired peace – the Walk of Peace – although a century ago they were the place of unattainable aspirations, when a word about peace represented a threat to the war policy and war goals. The materialized heritage of the wartime, inscribed into the surface of the Earth, was preserved, also due to the natural characteristics, throughout the turbulent period of the tragic century of the two World Wars, with the prolongation into the 21st century which united the territory along the Soča into a space of a shared history with a variety of hues. The Walk of Peace is a space of memory, a path through history, a path of meeting the places, the micro-worlds of a warfare day in sweltering summer sunshine, under the shelters of rock overhang, in trenches of the Doberdo plateau, a path past the memorials which mark the positions of military troops, and along the memorial walk finally leads to the tranquillity of final places of rest. The Walk of Peace addresses with a language that disappeared from the horizon of human communication a century ago, but today it naturally enters the area and meanders across the one-time border that has been separating for too long, but lost the last physical argument of separation with the Slovenian accession to the Schengen area. However, the Walk of Peace is much more than this, because it enters the sphere of memory, whose remarkable capacity is to forget and to remind and has the creative power of forming a common space of remembrance which is respectful because it knows and narrates without prejudice the historical story of the area and people along the SoÄ?a. The Walk of Peace from the Alps to the Adriatic The battlefield along the SoÄ?a, i.e. the Isonzo Front, left behind numerous remains. Military cemeteries, caves, trenches, charnel houses, chapels, monuments, outdoor museums and other memorials represent important material and non-material heritage of European history. The evidence they provide, the feelings they evoke, and stories they tell make them today the backbone of the Walk of Peace from the Alps to the Adriatic. The Walk is uniformly marked and suitable for both hikers and bikers and runs along trekking, biking and asphalted side roads. The Walk of Peace, which is divided into fifteen sections, crosses the state border between Slovenia and Italy several times. Each section can be walked or biked through within a single day. During the tour, it is possible to find accommodation in the settlements where a single section starts or ends, as well as in the mountain refuges. Those who would like to intensify their experiences can also find it as a starting point for more demanding tours. Major points of interest are accessible also by car or bus. The Walk of Peace is the right choice for all those who would like to spend their leisure time actively, enjoy magnificent views and the beauties of nature, become familiar with the history and culture of the place, meet the locals and taste local gastronomic specialities. Therefore, the Walk of Peace combines areas and people and rich cultural and natural heritage along the former Isonzo Front. It calls to mind all those who suffered during the Great War, and warns the world that wars should never happen (again). Therefore it primarily inspires the thought of the value of peace. and the Kras plateau to the Gulf of Trieste. The majority of the Isonzo battles were fought along the lower section of the Soča where the world is not as mountainous as along its upper section. The Italian Army reckoned to break the enemy’s defence more easily here than in the mountainous world. The last chapter of the fights along the Soča took place in the Twelfth Isonzo Battle which started on 24 October 1917, right along the river’s upper course. In literature, the Battle is also known as the Miracle of Kobarid (the disaster/fiasco of Kobarid for the Italian side). It started in the Bovec basin with a joint attack by the AustroHungarian and German Armies. They took the Italian defence by surprise with gas attack. Simultaneously, the advance was made from the Tolmin direction. The break through the Isonzo Front was followed by the advance to the Friuli lowland and, further on, to the river Piave, where the front stabilized on 9 November 1917. After a year of combats against the Italian Army and the collapse of the AustroHungarian monarchy, the Great War came to an end on 11 November 1918 with the capitulation of Germany. The warfare along the Soča, which ended in October 1917, left numerous traces. About 300,000 soldiers died in the battles along the Soča. War memorials, caves, trenches, fortifications and cemeteries now belong to cultural and historical heritage. They remind us of the suffering, sacrifices and deaths of thousands of youths and men of numerous nations. The war also bitterly affected the civil population in the direct vicinity of the front who had to go to exile. Those who returned after the War found their country ravaged, houses were in ruins and the political situation was changed. The places along the Soča fell to Italy. Total vertical drop: 1,240 m Section has all the characteristics of mountain trekking! Golobar alpine pasture (1,257 m) Golobar is a vast hanging valley with a diameter of almost two kilometres. There are numerous traces along the path indicating that the image of Golobar was different in the past century. More than by forestry and alpine pasturing it was marked by the events of the Great War. Due to its lee position and the proximity of the AustroHungarian first line of defence, which ran along its southern edge from Mt. Javoršček across the saddle Čez Utro to Mt. Kal, it became an important point from which military supply of this section of the front was provided. The valley was crisscrossed with trenches, tracks and roads; it was dotted with shelters and cabins. A ropeway conveyor ran up to this place. At the upper edge of the former pasture above the abandoned alpine pasture stands a concrete cross on a rock, erected in May 1916 by the soldiers of the 20th Hunters Battalion of the Austro-Hungarian Army. 2 Outdoor Museum Zaprikraj The outdoor museum lies between the alpine pastures of Predolina and Zaprikraj. It is located along the Italian first line of defence. The circular path runs past well preserved and partly reconstructed positions of the Italian Army. It leads through trenches, caves, gun- and mortar positions, and past the remains of cabins. When Italy declared war on Austria-Hungary, the latter decided to transfer its defence from the then state border to the mountain ridges on the left bank of the Soča. At the beginning of the war, the Italians were quite successful in the mountains above Drežnica, since they conquered a large portion of the western ridges of the Krn range, and on 16 June 1915 also the peak of Mt. Krn itself. The Austro-Hungarian troops had to move northwards to more difficult positions. On the positions in the north-westernmost part of the ridge above the Drežnica mountains, i.e. on Mt. Kal, they persisted all until the breakthrough of 1917. The Austro-Hungarian Army experienced the above-mentioned defeats because its troops initially deployed in this area were not on a par in mountain warfare with the Italian alpini. Under the western part of the Krn range, on the saddle between Mt. Kal and Mt. Krasji vrh, the Italians built a system of masonry and concrete trenches with crenels, drilled caves and made gun positions. In this way they protected the area against possible Austro-Hungarian attacks. At the same time, they were able to back up the attacks of their troops, launched in the direction of Mt. Javoršček and the Golobar alpine pasture, by way of shelling. At certain points, particularly on Mt. Kal, the positions of the two belligerent armies were only a few tens of metres apart. Numerous mule tracks were then made to lead up to these positions for the purpose of warfare, and they are still clearly discernible. 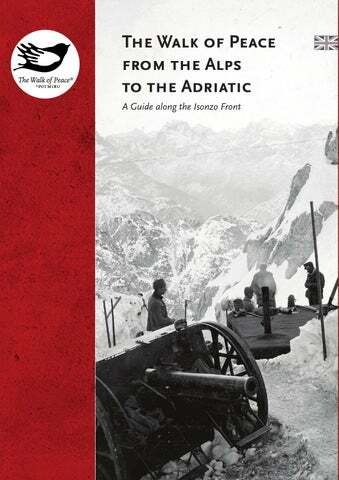 Likewise, a road from Kobarid to Drežnica and further on to the alpine pasture of Zaprikraj was made for the supply of the front. In the surrounding mountains the most furious fights took place in the autumn of 1915. In the following two years the two armies got stuck in their trenches, and major attacks were launched only occasionally. The dramatic shift happened only in the Twelfth Isonzo Battle in October 1917. Due to the strong resistance of the Italian Army the troops of the 55th Austro-Hungarian Division could in no way break through the enemy’s positions of defence on the first day of the battle. The Italian soldiers left their positions during the night when the order for retreat was issued, since the valley behind their back had already been conquered. Drežnica (555 m) The village was in the direct vicinity of the first front line during the fights along the Soča. Italian soldiers arranged their dwellings in these houses since the civil population had to go into exile. The village is dominated by the monumental Church of the Sacred Heart of Jesus, which was built in 1912 and remained undamaged throughout the war. It is possible to visit a private collection Muzejska zbirka Botognice in Drežnica. Drežniška cerkev s Krnom v ozadju. containing three diminishing concentric octagons in the upward direction. On the top stands the old Church of St. Anthony that was consecrated in 1696. Transferred to the charnel house were mortal remains of 7,014 known and unknown Italian soldiers who had been killed in the Great War and originally buried in different military cemeteries in the surroundings. Their names are engraved in the slabs of greenish serpentine. By the charnel house are also memorials dedicated to those Italian soldiers who died in the gas attack during the Twelfth Isonzo Battle in the Bovec area. These memorials were formerly located in the military cemetery at Bovec but were moved to Kobarid in 1981. Along the road from Kobarid to the Church of St. Anthony stand the fourteen Stations of the Cross. In the former custodian’s house next to the charnel house is now displayed a private museum collection Kobarid in the Great War 1917.
von Karfreit (Miracle of Kobarid), since a general belief was that an offensive in the mountainous Upper Soča Region could not be launched successfully. On the other hand, the Italians still remember this battle as the Disfatta di Caporetto, which means a complete failure, defeat, devastation at Kobarid. Today, it is the seat of the Kobarid municipality. Along the access roads the guns from the Great War are placed; they were hauled from the Soča riverbed from under the Napoleon Bridge by a group of the Kobarid youths and men. In 1936, i.e. before the Italian Charnel House was built, a 5-kilometre-long section of the road towards Robič was lined with lime-trees on both sides. When in Kobarid, one should not miss a visit to the Kobarid Museum which is dedicated to the Great War events on the Isonzo Front. It displays two years and a half of the warfare on the Upper Soča Region battlefields, the Twelfth Isonzo Battle in particular. There is also a private museum collection on the Great War Alberto Picco in Kobarid. The Walk of Peace Visitor Centre Available in the Walk of Peace Visitor Centre, managed by the “Fundacija Poti miru v Posočju” is information on the Walk of Peace, on the Great War and the Isonzo Front, as well as information on the posts along the Walk of Peace where accommodation and local food are available. It is possible to make arrangements for various guided tours which in addition to the history of the Isonzo Front include other typical features and peculiarities of the Walk of Peace (natural and cultural points of interest, gastronomy, sports activities, etc.). The Visitor Centre is well supplied with select local handicraft souvenirs; available is also a varied selection of tourist and expert publications. A permanent interactive exhibition on the Walk of Peace is also available to visitors. and the Etno-vojna zbirka (Ethno-War collection). Antiquity (Tonocov grad) and all the way to the memorials of the two World Wars, past numerous natural beauties offered by the gorge of the Soča and its tributaries. One should certainly not miss a visit to the Napoleon Bridge and a visit to the picturesque Kozjak waterfall. Outdoor Museum Dolina dei Bersaglieri The major part of the outdoor museum, opened in 2000, is taken up by the Dolina dei Bersaglieri. It is a karst valley, or doline respectively, between Hill 86 (The Redipuglia Charnel House) and Hill 117 (Monte Sei Busi). The doline got this name because a marking was found here with the symbol of the Bersaglieri Battalion. However, it is also known under the name of Dolina dei Cinquecento (Doline of the Five Hundred), because a collective tomb was discovered here, with five hundred corpses of fallen soldiers who were then buried in the nearby charnel house. In the area of Dolina dei Bersaglieri fights were going on between the Austro-Hungarian and Italian armies all the time from the First Isonzo Battle. Between July and August 1915, the area was conquered by Italian troops. Since the front moved eastwards, the valley was no longer at the first front line, so the command could be quartered there and a small war hospital was organized, remains of which can still be seen today as well as numerous structures with trenches and remains of soldiers’ cabins. Fortified Line of Defence on Monte Sei Busi Around the top of the hill Monte Sei Busi a section of the so-called Italian Trench (Trincerone italiano) can be seen; it is a large fortified line of defence which started at Monte San Michele (Debela Griža) and reached all to Cave di Selz (Selce), Doberdò del Lago (Doberdob) and Monfalcone (Tržič). It is also known under the name of Trincea Mazzoldi. It was built on the basis of a trench that had been dug by Austro-Hungarian troops when they had still held this area in their hands. In 1916–1917 the Italian Army fortified it with concrete and thus provided for effective defence in the case of Austro-Hungarian counter-offensive. After the Twelfth Isonzo Battle the trench was of no use. Because of the Austro-Hungarian attack in the Upper Soča Region and their advance to the Friuli lowland the Italian Army had to leave the trench immediately, since it was the only way to avoid being besieged. 14 Thematic Park of the Great War, Monfalcone Tržič Over some four square kilometres of the karstic hills above Monfalcone extends the Thematic Park of the Great War (Parco Tematico della Grande Guerra). At the western edge of the Park stands a fortification of medieval origin called La Rocca, which is also the symbol of the town of Monfalcone. The present-day fortification consists of a square tower surrounded with a circular wall, and remains of the moat and the counterscarp on the outside. The Thematic Park is composed of three different thematic complexes which enable a visitor to learn about this war area and the events that happened here from June 1915 till May 1917. The first two thematic complexes include the redoubt on Hill 121 (ridotta di Quota 121) and the trench on Hill 85 (trincea di Quota 85). The two structures had been part of the Austro-Hungarian defence system until they were occupied by the Italian Army after the victory in the Sixth Isonzo Battle in August 1916. The first thematic complex is characterized by a complicated system of trenches and gun positions, and the second by the line of defence with shelters for soldiers. Hill 85 (Quota 85) is dedicated to Enrico Toti. In the third thematic complex visitors can see the Joffre trench (trincea Joffre) and the cave Grotta Vergine, an important Austro-Hungarian line of defence which was conquered by the Italian battalions as early as June 1915. Between Hills 98 and 104, there is another trench in the Park, trincea Cuzzi.